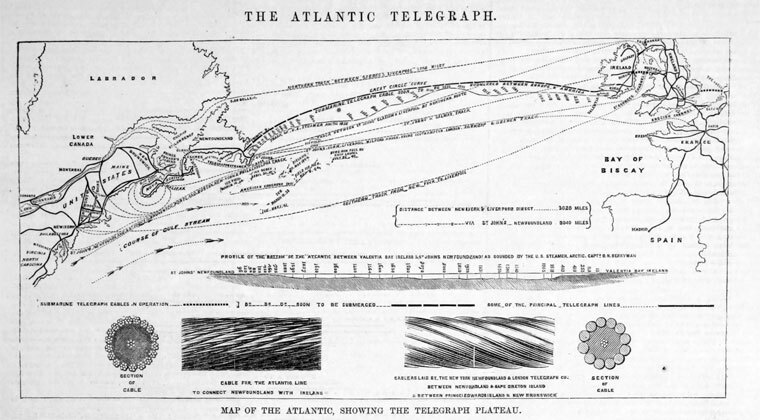 1856 The Atlantic Telegraph Co was a company formed to undertake and exploit a commercial telegraph cable across the Atlantic ocean, the first such telecommunications link. The project stemmed from an agreement between Cyrus Field, John Watkins Brett and Charles Tilston Bright and was incorporated in December, with £350,000 capital, raised principally in London, Liverpool, Manchester and Glasgow. The board of directors was composed of eighteen members from the UK, nine from the U.S. and three from Canada. The original three projectors were joined by E.O.W. Whitehouse as chief electrician. Curtis M. Lampson served ably as vice-chairman for over a decade. The board recruited mathematician William Thomson (later Lord Kelvin), who had publicly disputed some of Whitehouse's claims. The two enjoyed a tense relationship before Whitehouse was dismissed when the first cable failed. 1858 June: Two vessels were involved in laying the cable - The Niagara and The Agamemnon. Having paid out 142 miles of cable, a break occurred; tests indicated the cable must have parted at or near the Agamemnon. 1865 C. F. Varley chief engineer of Electric and International Telegraph Co, who had been a member of investigative committee set up by the company and the government into the failure of the first cable, was appointed chief electrician for the second one. When a second cable, under Thomson's supervision, was proposed, a new subsidiary company, the Telegraph Construction and Maintenance Co (Telcon), was formed to execute the new venture. 1865 On the failure of the expedition to lay the second cable from SS Great Eastern, a third company was formed to raise the capital for a further attempt, the Anglo-American Telegraph Co.
1866 The next expedition was a success and also succeeded in recovering the lost second cable. The service generated revenues of £1000 in its first day of operation. 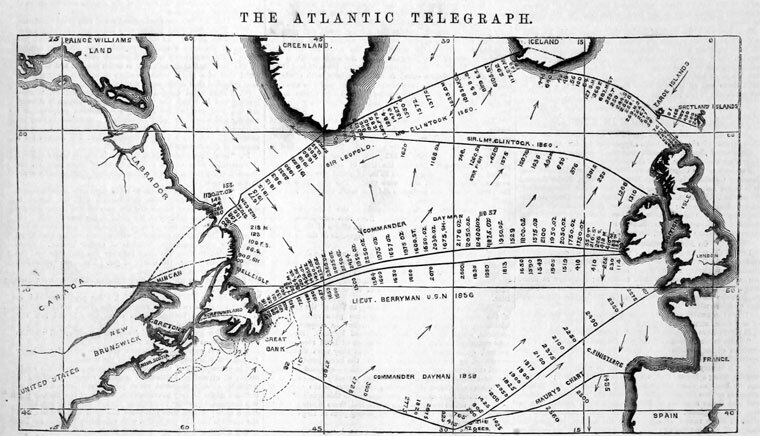 The Atlantic Telegraph Co owned the original 1865 cable, and the two companies made an agreement until 1873. 1868 George Saward was the secretary of the company and presented on the history of the company at a meeting when it was agreed to merge with the Anglo-American Telegraph Co.